IDF completes military operation sparked by discovery of weapons in package sent via post. The IDF on Tuesday night completed a joint IDF-Shabak operation begun eight months ago after terrorists from X ordered weapons parts and ammunition via the internet. The first arrests were made in December 2016, when nine of the suspects were found and arrested. Investigations revealed hundreds of laser and weapons sights, ammunition, vests, spare weapons parts, weapons ensembles, and other items. These items were delivered to various stores in Judea and Samaria, the last of which was shut down on Tuesday night. During the course of the operation, three of the cell's ringleaders were arrested, and four others were arrested while in possession of M-16s, 130 bullets, 90 magazines and an additional 170 magazines, 42 flash hiders, 127 weapons parts, binoculars, an axe, three vests, an M1, a gun, and more. 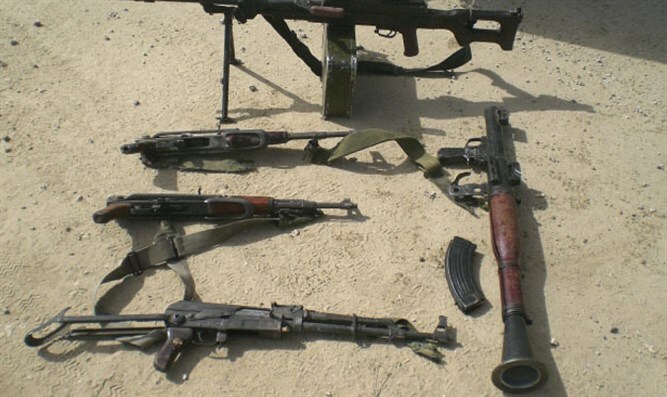 An IDF spokesperson noted that in the past year, over 50 illegal weapons factories located in Judea and Samaria were shut down. "It's a whole industry," said a Judea and Samaria Division commander who helped uncover the cell's members. "These packages are sent via the post office, and they're marked as 'plastic parts' or 'metal parts.' The recipient's address is changed so as not to give away his identity. "When you get into the story of weapons in Judea and Samaria, there are two main issues. The first one is the manufacturing of Carl Gustav weapons. The second issue is importing of weapons by merchants, who bring in spare parts for various weapons models. It goes from the seller to the post office, and from there it arrives at different stores and merchants. "When the price goes up, so does the number of home-made weapons, in an attempt to compensate."